Cultural destruction has always been a part of warfare. Nazi Germany’s attempt to remodel Europe according to its own worldview was not limited to invasion and mass atrocities: hundreds and thousands of books, works of art and other cultural relics were destroyed or looted. Today is no different. From Mali to Syria, heritage sites are being razed to the ground. Even by historical standards, though, the actions of ISIS have left many shocked: “In Iraq, they’ve gone on a rampage of destruction not seen since the Mongol’s sacking of Baghdad in 1258,” CNN reported as ISIS ran bulldozers through Syria’s ancient city of Palmyra. A new map from the Antiquities Coalition hopes to bring attention to the scale of this loss, and highlight those sites that are still at risk. “We talk a lot about cultural heritage destruction, but it’s the visual aspects of it that captures people’s attention,” the organization’s founder told journalists after the map launched. The map is made up of several layers. The first layer displays the areas that are under the direct control of terrorist groups. 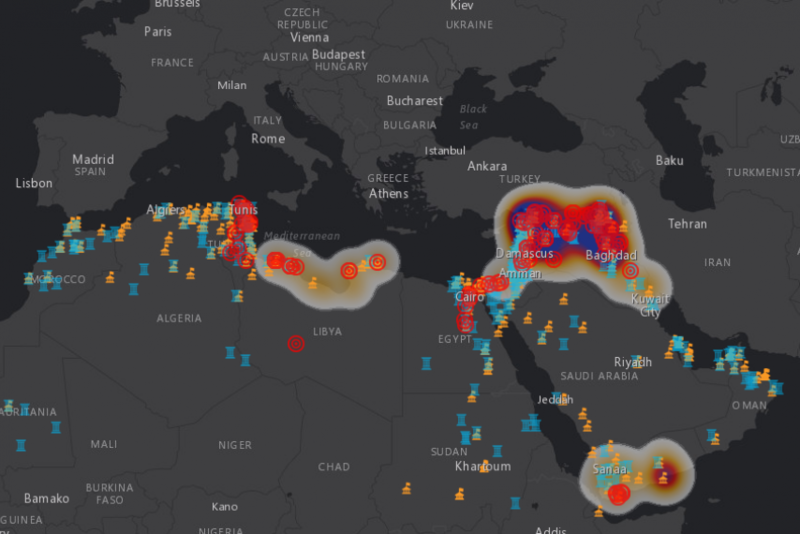 The second uses red marks to indicate cultural heritage sites that have been deliberately targeted by extremists. The third layer pin-points UNESCO World Heritage sites (in blue) and the fourth highlights museums (orange). The full interactive version provides more information on each of the sites. The Antiquities Coalition has also put together a collection of “before and after” photos that reveal the damage inflicted across the Middle East by terrorist organizations. In Syria alone, six UNESCO World Heritage sites have been damaged and destroyed since the start of the civil war. But when thousands of people are being killed, enslaved, raped or forced to flee, some might question whether the protection of buildings and archaeological sites is really a priority.